Build has graduated over 1,700 aspiring entrepreneurs. Build graduates come from over 100 zipcodes in metro Detroit. Build participants are 45% African American, 42% Caucasian, 5% Hispanic, and 5% other ethnic backgrounds. 83% of Build students are female. 73% of graduates are low to moderate income, according to the U.S. Department of Housing and Labor. 90% of Build graduates feel more confident in business knowledge. At least three Build grads have been in the Top 10 Finalists every year in the Hatch Detroit competition and at least one Build grad in the Top 4 every year with Build grad Sister Pie winning $50,000 towards her business in the 2014 contest. Build had eight graduates in the 2015 NEIdeas $10K competition and Build grad Sweet Potato Sensations won in 2014. Build classes are offered in locations all over the city. Classes have been held in downtown Detroit, Livernois, Hamtramck, Southwest, and Grandmont Rosedale. Build graduates are regularly chosen for the Motor City Match in neighborhoods like Livernois, West Village, and Grandmont Rosedale, including Detroit Vegan Soul and Good Cakes and Bakes. 77% of Build graduates were connected to resource they were not aware of. Over half of Build Alumni collaborate with one another on their projects and businesses. Build was voted the second most used entrepreneurial resource and the most helpful resource, according to the 2013 Southeast Michigan Start-Up Survey. Since December 2013, Build has endorsed 24 small businesses and raised $136,450 in micro-loans with a 98% repayment rate through the Kiva funding platform. 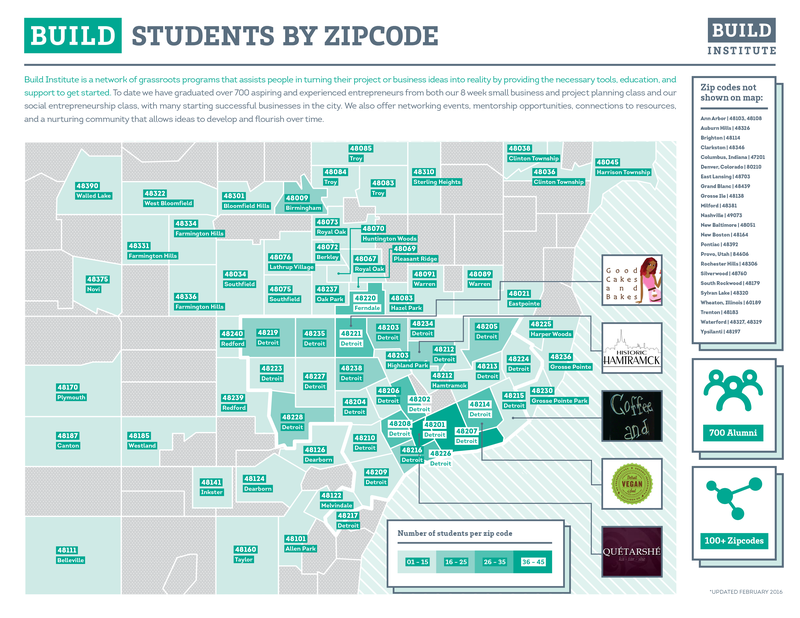 See more of Build’s Impact in the alumni survey and zip code map below.